Roosters can be aggressive and loud. 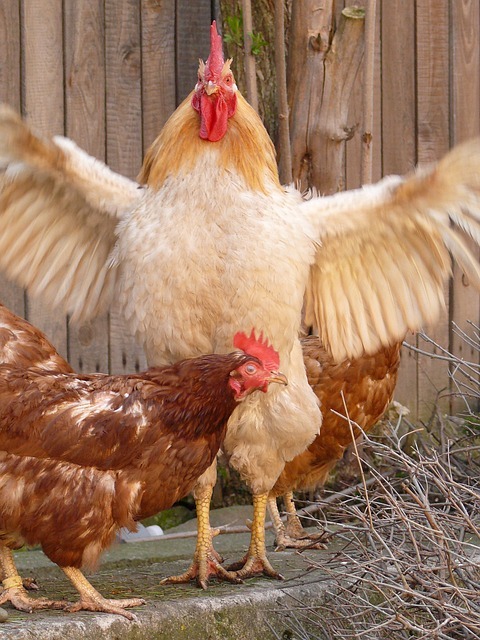 Many chicken keepers even avoid roosters in their flock due to their “complicated” attitude. They are aggressive and often bully other chickens in the flock. Most chicken keepers keep one rooster per 7+ hens ,none at all or in some cases separated from the hens. Chicken keepers that allow their eggs to hatch can sometimes get a few unwanted roosters and are forced to send them in a new home or put them down due to the unstable character the rooster can have. However, there are steps that a chicken keeper can follow in order to raise a friendly rooster that can protect your flock. – In order to raise a rooster that will be friendly to you and the rest of the flock you have you need follow some rules concerning the process of raising a cockerel into a rooster. Although small cockerels are undeniably cute and cuddly if you spoil them too much they will not be able to provide good protection to your flock. Also it is important that you do not show fear to your rooster and show him that you are the authoritative figure. – Start when the rooster is young. Spend as much time as you can holding the cockerel and do NOT hit him. When the rooster is still young you also want to start slowly introducing him to the flock and that will help the process of making the rooster friendly with towards them. Smacking, punching or kicking your rooster in order to show him who`s boss is not a good idea and it never will be. If you want to show authority to your rooster just grab him and hold him up for about 10/15 minutes until he stops rebelling and stays calm ( if you tried this method and it hasn’t worked Check Out This Article ). Spraying the rooster with water also doesn’t work and it can hurt your rooster – badly. 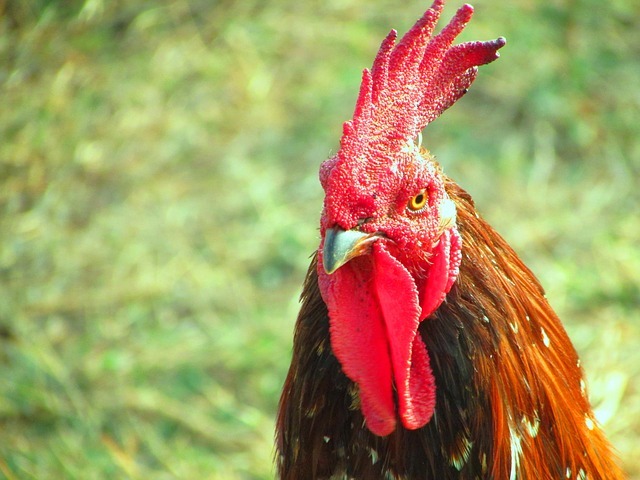 Roosters develop habits that can question your authority. They also want attention so the best way to avoid some of these habits you need to pay no attention at all to your rooster when he is doing some of those activities. Do not let your rooster mate in front of you, this is typical behavior for roosters that want to challenge their chicken keepers and if you pay attention to him while he is doing it that will only motivate him to do it more. As a part of the challenging behavior of the rooster there is also the direct approach when the rooster attacks his keeper when the keeper enters the run. During winter if you see a rooster holding younger chicks under his wings in order to keep them warm you will know that you have done a good job raising a friendly and useful rooster. The same goes with the hot summer days – if your rooster is leading younger chicks into the shade it means that you have done a good job. If you are keeping roosters and hens together remember that it goes one rooster per 7+ hens. If your roosters have grown up together and are familiar with each other they will have no problem living together. Some chicken keepers like to have a separate coop for their roosters – this is a good idea but not completely necessary and before deciding on this make sure that you can afford the expenses of maintaining another coop. Next Article Do NOT Make These Mistakes When Keeping Chickens During The Winter! We have a HUGE Buff Brahma Rooster, the biggest I ever saw, but he is also the friendliest, and most attentive toward his ladies you could ever hope to find. Big Boy weighs almost 20 pounds, so help me, but doesn’t have a mean bone in his body, he is about the size of a medium size turkey, but eats out of the hand of my 8-year old grandson readily. He finds food for his ladies, then stands back while they eat, and when I throw treats to them, he rarely runs ahead of the hens, rather he waits until I throw some his way. He stands guard over them and whenever they sense danger, they run to him for protection as quickly as possible. Just the other day, Big Boy found a snake in the yard, and snatching it up, he ran with it in his beak while the hens ran after him in pursuit. He has spurs about 2 inches long but he poses no danger at all to us, rather we can pet him and he eats it up, even our two dogs get along with him, but he watches over his little flock with a watchful eye out for danger, and calls them to him, ready for action, as soon as he spots any kind of threat at all.